Holy hell, did I write this?? Nice and fine are not love no matter how it looks on paper. 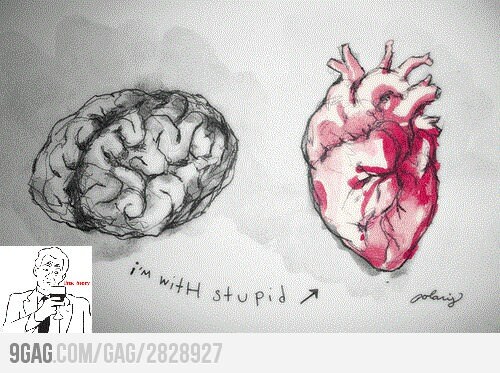 Mmm, d’you know what, I’m not sure it’s a case of either the brain, or the heart rules. To a large extent, I think that the two are constantly discussing and influencing each other. And looking at people around me, I see that love can sometimes grow out of fine… But it is a choice borne out of freedom, not what well-intentioned people tell you is best for you. You have given me such peace. I’m struggling to figure out why I’m in still deeply in love with a notorious leader of a bikie gang when I am normally completely turned off badboys – always have been, WHATS HAPPENING TO ME. I’m an old woman damn it, this should start happening to me in my age, this is what happens to silly teenage girls. What has he done to me. It’s been 1.5 years since I left him because of his chosen lifestyle that I didn’t want to impact on my children. 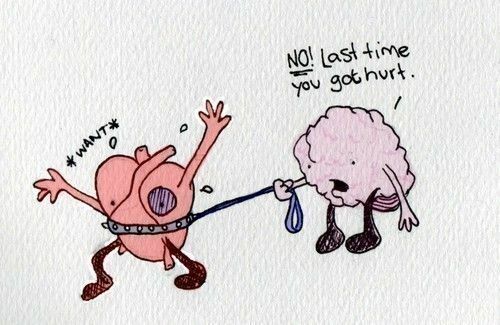 My brain better kick into gear before I chase him to come back to me. 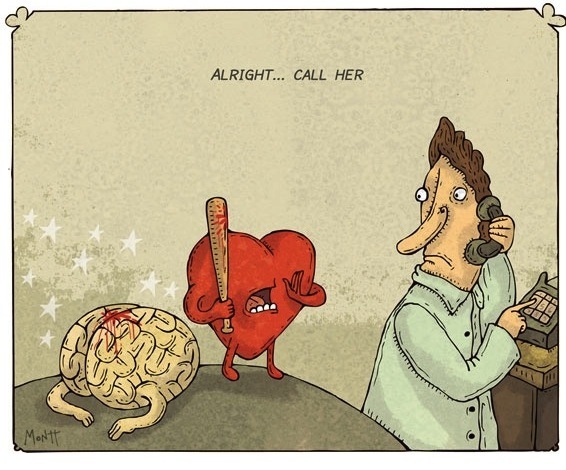 In my reading about brain chemistry, I have realized that love like you’re describing is truly a chemical addiction. So I think if you think of it that way, and create for yourself a program to get through the addiction to him, you’ll have a better chance of succeeding. While I’m a true romantic at heart, I do think that there are times when we need to move past someone who is inherently unhealthy for us, and it sounds like some maternal part of your brain knows that this is true for the guy you described. Keep your kids in focus and treat your “love” for him as an addiction. Hell, I’d even go to a 12-step program if I had to. I had an abusive boyfriend when I was much younger. For 2 1/2 years he beat me up periodically. It took a move 2,000 miles away and a new man to break the addiction I had to him. But I did it. And no man has ever struck me again. The heart wants what the heart wants … but if the heart cannot have what it wants to get, you must train your mind all it should forget; lest ye be burdened with days of sorrow and regret. Yes, very true. But ever, ever so hard to do. I know this blog post is old now, but I just wanted to give a massive thank you and say how glad I am that I found this post. Last year I was dating a kind, stable, lovely guy who seemed perfect for me – as everyone around me pointed out all the time – but my heart didn’t seem to agree. I tried so hard to love him, but in the end had to break it off despite everyone telling me I was making a mistake. However I am so glad I did, because recently I met someone who makes my heart flutter in just the way it didn’t with my ex. I only wish I’d found this blog post back when I was agonising over whether or not to stay with my ex, as it would’ve made my decision a lot easier. Instead I had to learn the hard way that the heart just wants what it wants and it really can’t be changed no matter how “perfect” somebody may seem. Thank you for the kind words, and I am SO happy for you! Your words are timely, too, because I am once again in the dating world and once again wrestling with this idea. But your comment reminded me to go back and read my own words and trust them. 😊. So thank you for that and best of wishes for your new relationship!